I haven’t forgotten about my blog community, though. And after I posted an image of this socca fest over a month ago, I have received so many requests for the recipe. Soccas are a popular street food in the south of France. 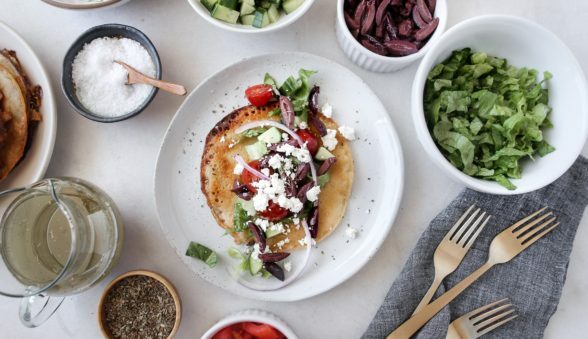 They are a cross between a pancake and crepe, but they are savory and made with chickpea flour. The Italians have a version of a socca called a farinata. Because soccas are made with only chickpea flour, they are both gluten-free and grain-free. They have a light bean flavor, and are very tasty. I’ve been making soccas for years and taught the recipe at a retreat I hosted in France many moons ago. I used to serve them to my friends with drinks, but in the last few years I have loved serving a salad on top. 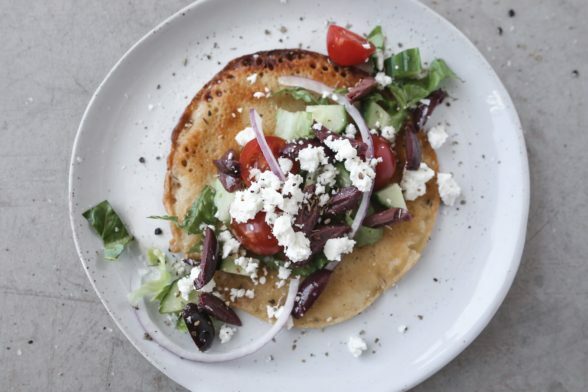 In my Mediterranean-inspired class last year, we ate them with a Greek-ish salad on top and taco-style like a tortilla. I’ve made soccas both on the stove and in the oven in a skillet, but the stove is faster. Some people will get a little char on the socca which is really nice. I add some smoked paprika to my batter to simulate a little of that great smoky flavor. 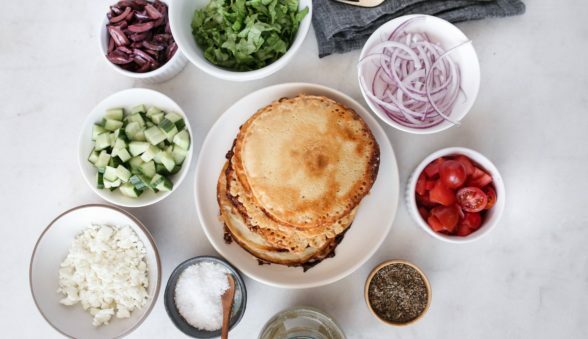 These pancakes are so neutral that you can serve them with anything. You can even use them as a base for a pizza or with a dip. I reheated leftovers once and stuffed one with scrambled eggs and hot sauce. What’s nice about soccas compared to tortillas is that there’s tons of protein and fiber in the chickpea flour. For all you pre-ahead-ers, you can make the batter in the morning and cook up your soccas later. Remember how much kids like topping bars, so go for it! I’ve got to run for now. Keep up with me on Facebook and Instagram while I’m in New York! In a large bowl, whisk together the flour, salt and smoked paprika. Pour the water in slowly and whisk until smooth. Cover and let sit for at least 15 minutes or longer if possible. You can also make this many hours ahead and keep in covered in the refrigerator. Preheat a medium heavy cast iron skillet over medium-high heat. Add 1 Tablespoon of oil and swirl the oil around to coat the bottom of the pan. Pour in about ¼ cup of batter and cook until the edges become slightly dry and the bottom is crispy, about 4 minutes. 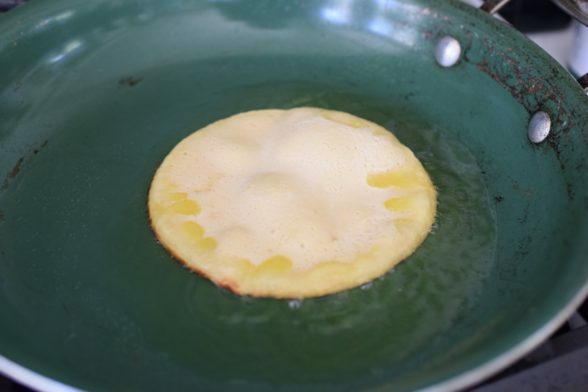 Flip the socca over and cook for 1 more minute. 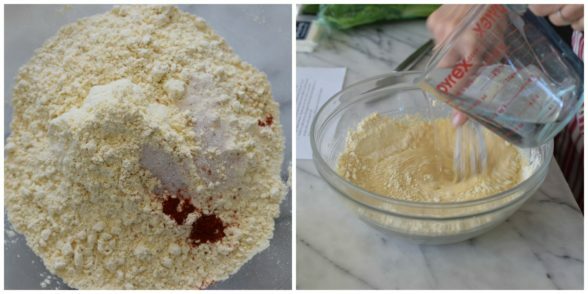 Transfer to a plate and top with suggested Mediterranean salad ingredients. Or eat plain with a chilled glass of rosé. Soccas can be kept warm in a 200 degree oven for up to 30 minutes. This was amazing! I haven’t followed a recipe in years. So glad I did!! Hi! can;t wait to make these. What size skillet per 1/4 c? I like to have some breathing room, so anything from 8-12 inches is great! This is the most simple, wonderful recipe. I made it for my family this evening after a busy week and not wanting to particularly spend much time in the kitchen. Huge hit all around. Thank you for this.